The last event at Studio One Gallery. An eclectic group of artists take on their influences in this exciting exhibition at Studio One Gallery, in the heart of the music world in Wandsworth. Each artist has chosen to reinterpret their favourite album cover in their medium of choice. 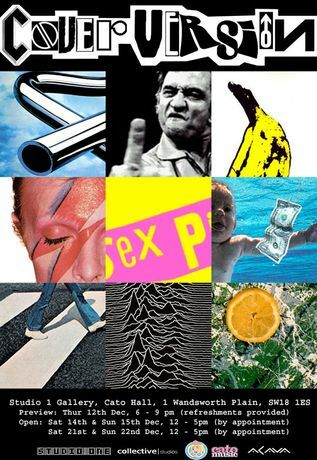 Album artwork has always been linked with fine art and many world famous artists and designers have created some of the most iconic images of our modern world. Peter Blake's cover for 'Sergeant Pepper's Lonely Hearts Club Band', Andy Warhol's 'Banana' for The Velvet Underground and Nico, and designer Peter Saville's work for Joy Division all stand out as truly iconic images of the pop and rock world. Here, each artist has selected an album or EP that has had a major influence on them, and used it as the basis of their own artistic interpretation.